High sensitivity, low noise and a phenomenal 10.3 Megapixels of resolution. This is the world's first camera to combine an APS-class sensor with Live Preview of the scene, so you can compose your shot with full framing, exposure and white balance accuracy. My name is Alan Paterson from East Kilbride in Scotland and I purchased my Sony DSC R1 in January 2007. I was a bit reluctant purchasing the Sony DSC R1. Although I had read excellent reviews on this camera, the sales assistant tried to persuade me to go for the new Sony Alpha DSLR instead (or any other SLR for that matter). I'm glad I didn't listen to him. This camera is superb. I photograph stills (mostly bouquets and fruit baskets) for gift delivery web sites. I have to say that I was more than pleased with the results of the DSC R1. I especially liked the LCD display. This is not a normal LCD. Fantastic and innovative idea. No more crouching or kneeling on the floor to get the best angles. The display rotates and twists and can be viewed at any angle. The automatic White Balance settings were also excellent and produced the exact results I was looking for without the need for manual white balancing. I use tungsten lights and the tungsten setting on the camera gives me the exact white balance I need. The 10 Mega Pixel images are superb but are way more than enough for my purpose as I normally convert to 500 x 500 jpg anyway (much smaller images). The battery life was nearly three hours which I was pleasantly surprised at. I have found it to be longer than the manual states! Camera gives you plenty of warning when the battery is running low. However, the battery is charged whilst inside the camera which might be a little inconvenient for pros who want to charge a spare battery while still using the camera. Another real advantage for me was that dust cannot get onto the sensor. As the lens is fixed (and an excellent lens it is by Carl Zeiss) you never need to worry about dust on the sensor. Although a fixed lens may not suit some of the professionals (as they may need to change lenses) it is perfect for me. Although the lens cannot be removed, "attachments" are available to enhance the lens to your particular type of photography. I would think that only avid professionals would ever require anything beyond the normal lens. Multi metering mode is great and exposure levels are easily set. It has the useful bracketing function but the range does not go beyond +/- 1. I was surprised at this as my old Cannon EOS 350 had a far wider range. However, this is trivial as I find that bracketing exceeding -/+ 1 is not required for my purposes. I liked the fact that Sony has had the insight to accept CF cards as well as memory sticks which is definitely a plus point. Compact Flash (CF) cards tend to be less expensive than the Sony memory stick and I think it is a bold move by Sony to give the camera a more universal appeal. Several reviews I have read criticized the zoom but I find the zoom more than adequate for my needs. However, if you require a camera with a high zoom it may be worth checking this out to make sure that the DSC R1 suits your needs. I would also like to praise the Sony Picture Imaging software. It is informative, flexible and very easy to use. Finally, a couple of points about the LCD. Firstly, histograms. With DSLRs I have used the histogram is only available after you have taken the shot. Not so with the DSCR1. The histogram can be viewed "live" on the LCD screen. Amazing! Secondly, the tilting LCD also allows you to take pictures without alerting your subject that you are in fact taking a picture. For example, you can hold the camera at waist height, tilt the screen up and off you go. Very discreet and results in far more "natural" subjects ie they are not posing (or running) for the camera. You will have concluded by now that I love this camera. The burglar who stole my Cannon EOS 350D (long story) has done me a favour as I have went out and replaced it with this. I am now producing better pictures than my Cannon EOS (and Nikon D70) can produce. Now don't get me wrong, the Cannon and Nikon cameras in the same price bracket are excellent - just that this is slightly better. I even got to compare it to the new Sony Alpha recently and I still preferred the DSC R1. OK it's a bit of a hybrid somewhere between "point and shoot" and DSLR but I do believe it gets better results, at least for my type of photography work. I will admit that these results are only marginally better and it would take a keen eye to spot the difference. It's a shame that this camera seemed to be overlooked when it was launched. I think it is very much in the shadow of the new Sony Alpha which is a shame because if people gave it a try they would see just how good this camera actually is. The battery is charged whilst inside the camera which might be a little inconvenient for pros who want to charge a spare battery while still using the camera. I would like to have seen a video function. Video on MPG format is available on the other less expensive cameras in the Sony DSC range. I do not know why Sony decided to not include this function on the DSC R1. The timer is annoying as you have to keep switching it on before each timed shot. I use this function regularly and combined with my tripod, eliminates camera shake. Annoying to have to remember to switch timer on before each picture. My Cannon EOS 350d timer stayed "on" shot after shot until you switched it off which was much better. My only other grievance was the size of the camera. Although I acknowledge that Sony have crammed a lot into the camera, I must say it is too big for my small hands. I must confess I preferred the grip on my much smaller Cannon EOS 350D. Excellent camera that beats the DSLRs in the same price bracket. Fantastic pictures, great features, long battery life, choice of memory stick or Compact Flash, no dust to worry about, moveable LCD . I purchased this item from Jessops who I have always found to have fair customer service. I have never had to use Sony customer service. well, i finally bought the sony r1, after along wait for the price to drop, and read all reviews on it..i got it for 565$. build quality, good zeiss lens, 24mm wide angle, iso change on cam just a botton..great colors balance, low noise and high iso, big cmos sensor, use both pro stick and cf card, long battery life , displays batt life in mins, useable high iso at 400, top view and swivel lcd, manual tele zoomring, good raw files, has auto feature to use both lcd viewing and thru viewfinder, if you want the best images on a point and shoot this is it!, eventhough its the most expensive point and shoot camera. battery charges in camera is a big draw back, while you charge the batt, you cant use the camera to shoot, bad feature, hope sony improves it on next camera. the camera design is so weird, the grip is over size, off balance on hand, view finder housing is over size, to use external flash you have to go to menu and change it everytime, and change back to use pop up flash, cant use both flashes, missing OIS(opical image stabilizer), its heavy and big, tele at 120mm is at f4.8, AF is not that fast, its kinda slow, especially in dark, sony should learn from this cam and improves it on next camera, im sure they will.the price is abit too high for a point and shoot, no video mode, macro is not that good at 15inches away from subject. other than that i love to use it, its my main camera to walk around with, i love the image result quality, thats why i bought it, i know no camera is perfect yet, for the price i paid im not complainning, its a dslr wanna be, very close to dslr results. i strongly suggest to any one who wants a back up to dslr..
-Wish there were a way to increase the tele range considerably (beyond the 200mm given by the converter). The bottom line is that this camera does have limitations but none that I can't live with and the image quality is second-to-none. The price of this camera has come way down and I suspect it won't be availabe for long. If you're looking for an awesome deal, read the reviews of this camera and if you can work within its limitations, the R1 is a wonderful machine. This is my second camera, my first being a little Canon digital point and shoot. Although my experience is limited in both photography and cameras, I will offer my opinion of the R1 because as of this writing, I believe the camera is soon to be discontinued. There is already much written about the uniqueness of this camera and the many professional reviews of the R1 offer plenty of detail. There is a ton to like about the R1 and there are some factors that will be deal breakers for some people. Read the professional reviews try the camera to get a firm idea of these factors. The bottom line for me is the quality of the prints and the R1 delivers very well in this department. I shoot in RAW and leave the contrast and sharpness at their minimum settings in the camera. The large prints I've made from the R1, after minimal processing in photoshop, are truly outstanding in their quality. Outlined in my first review and new review summary here. But i'll be redunant and enthusiastically preach them again! 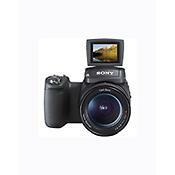 -price (899 with sony 100 dollar rebate for financing with them, normally 999 and worth every penny) -performance -image quality (best color rendering of any camera to date) crisp clear low distortion and noise images, great cmos sensor! -size and weight -ergonomics, most all will like its size from small hands to large. Seems to stick to your hand, good luck dropping it -features (for what it is, you can do anything within that spectrum!) -durablity, typical Sony quality only better this time! -focal range, great wide angle! acceptable telephoto! -speed, not intended to be slr competitive (although prefocused shutter release rivals fastest of the most expensive cameras made) they couldn't make it for this price if they made it faster. -average macro performance (however they sell a macro lens add on which I will purchase and review in the future) -power on switch not as good as the F-828. It almost seems they made the switch go the wrong way for on and vice versa for off, maybe its just me? im used to pushing forward for on, on the 828 I like that! forward is go! This is a brief folow-up review of the R-1 now that i've had time to play with it. First of all, I have to say that Sony really outdid themselves with ergonomic and ease of menu option changes, say over the F-828. Sony loyalists should love the changes. This camera is so easy to use, it seems almost everything important is within reach with your thumb. I have small hands and have no problems with making adjustments without having to look for the buttons. It took me less than one full day to get to this point. It seems it is a part of me now. I love this camera. I like its weight, and it is lighter than I expected from reading other reviews. It's not a pocket point and shoot no, but for a full size DSLR style camera, it is the perfect weight and size. Also a bit smaller than I expected really. The lens barrel and left hand side of the body is nice and beefy and breeds confidence in its durablity. But enough on size and ergonomics. First impressions on image quality. What a jump into the future. The rave reviews out there are right. Low well grained noise up to iso 400 and decent (but not for my usage) to iso 800. Super crisp from corner to corner and no percievable lens distortion to the eye, you really have to run serious tests to see any. Wow. Color is the usual Sony cornered market quality only they added more color options to the user, from super saturated to perfect adobe color matching and hue rendering. If you want true color, no camera can match its quality. Can you believe that for under 1 grand?!!! The lcd is nice, neat idea, not overwhelmingly wonderful, but works great with its swivel design and is crisp and clear. The viewfinder is wonderful. I find the auto eye detector to be a great addition and use it most of the time. It has its uses and works great especially for landscape shooting when you are going back and forth between lcd view, eye viewing, and viewfinder. Nice, one less thing to switch back and forth. It works great in other circumstances as well. Battery life is extraordinary. Thats all I can say. I've got over 300 mins routinely in decent temperature conditions 50-80 degrees. And i'll add that I won't throw away my F-828 (it works great for macro shots people) but I will probably use this camera 90% of the time now. It is a step up huge and Sony did it in all the right places. Im so pleased I could just kiss the engineers (on the cheek of course... uh hum) for listening to it's consumers. I think many people are going to get great shots of professional grade with this camera. Canon and Nikon, be wary, Sony is making a slow but steady charge into the serious world of high end photography! Lastly i'll add that everything snaps clicks and glides smoothly, it is a tight and silky piece of machinery and I don't mind the plastic body at all. They make plastic feel like it's engineered out of a new alloy never before used or something. They cut costs in all the right places to bring this camera to the price point many will love.